Jackie Klemme-Beisert wanted to share her experiences on parenting and all those crazy moments that have made her who she is today. 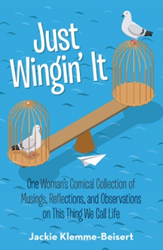 It prompted her to write “Just Wingin’ It: One Woman’s Comical Collection of Musings, Reflections, and Observations on This Thing We Call Life” (published by Archway Publishing). For more details about the book, please visit https://www.amazon.com/Just-Wingin-Collection-Reflections-Observations/dp/1480855197. The book shares a collection of anecdotes and other stories based on Klemme-Beisert’s life. It humorously reflects on the ups and downs of raising four children as well as how a crush on Leif Garrett transformed into a dream of becoming an actress. It also contemplates why an epiphany led to a pledge to dance on every Coyote Ugly bar in the world and how overcoming a long-held fear led her to drive into Mexico without a map, a phone or knowing a lick of Spanish. Klemme-Beisert’s other amusing stories include helpful hints for newlyweds, insight on why a bloodcurdling scream will summon a game warden quicker than anything and tips on why no one should ever put dishwashing liquid in a dishwasher or let a pet bird fly near a ceiling fan. By sharing her life experiences, Klemme-Beisert hopes readers will realize that not everyone is perfect. However, they have to take chances and take more time to really appreciate and laugh at their life's moments. Jackie Klemme-Beisert was raised on a hog/grain farm in Indiana. She later lived with her mother and stepfather in Texas. She has enjoyed a successful career in the retail/merchandising and pharmacy fields. Klemme-Beisert is a former humor columnist, mother of four children and currently resides in Magnolia where she is working on her second book.